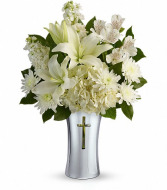 A shining tribute to a life well lived, this pure white bouquet of hydrangea and lilies is arranged in a beautiful ceramic vase with gleaming metallized finish and reverent cross cut-out. It's a lovely gift of remembrance for the home or service. 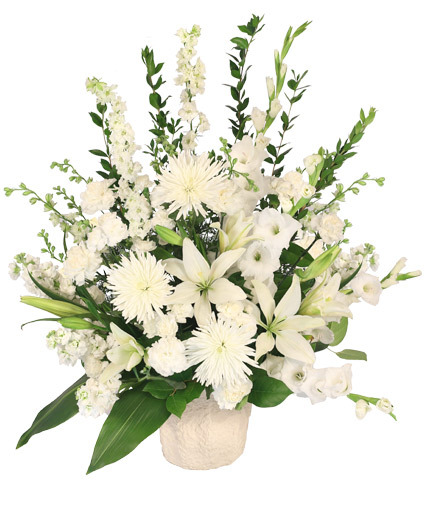 White hydrangea, white asiatic lilies, white alstroemeria, white stock, and white cushion spray chrysanthemums are accented with lemon leaf. 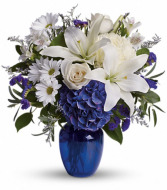 Delivered in Teleflora's Shining Cross vase.